We suggest that Alternative 6 be modified to reflect the parameters that we proposed in our comment letter of October 20, 2008. BRDA 1 would provide temporary storage of 750 AF of fine sediments, intended to be completely transported downstream following a series of flood events. This is accomplished by mana ging a pilot channel that follows the alignment of the existing river side-channel. 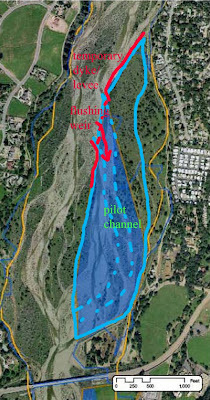 This pilot channel will direct high flows from the mainstem channel through the disposal area to initiate and actively erode the sediments. This is controlled with a temporary levee (or containment dyke) that includes a ‘flushing weir’ at the upstream end of the pilot channel. 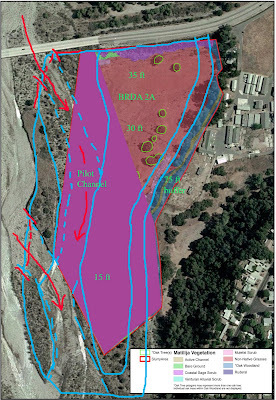 The footprint outlined in blue in this figure includes expansion of the disposal area onto the floodplain terrace to the east of the active channel. This would provide greater insurance that flows would not enter behind the disposal area and threaten downstream infrastructure. This area will also provide a staging area and additional capacity to account for the pilot channel, which would necessarily be an area of lower fill depth. Adaptive management of this area would include monitoring the containment dyke and erosion to ensure release of fine sediments downstream occurs during predetermined flow events. The weir entry is designed to direct flows into the pilot channel during such events to facilitate removal of stored sediments. In this manner a large flood event may effectively remove a large portion of the temporary sediments (highlighted in blue.) In the dry season following such an event the remaining sediment could be re-distributed within this erosion zone in preparation for the next flood. Eventually this area would return to natural floodplain with little evidence of the slurry activities. 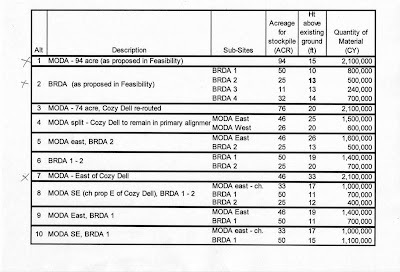 The BRDA 2 disposal area may store 600 AF of sediment (BRDA 2 with BRDA 2A superimposed.) BRDA 2A is a 15-acre sub-area in which the total deposition would average 30 ft deep. 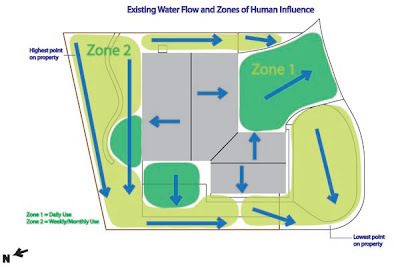 The erodable area (pink) includes a pilot channel designed in the same manner as BRDA 1. The fill is deepest adjacent to Baldwin Rd, which could be used as a containment dyke. The east edge of the disposal area will taper down to leave a 75 ft buffer/channel from the toe of the bluff to accommodate existing flows and maintain the mature sycamore and oak trees. The disposal area is expanded slightly to the west and south to provide additional capacity to account for the buffer zone and pilot channel. Adaptive management would be used to optimize the erosion of temporary storage areas as described for BRDA1. The upland terrace would be revegetated, but the pilot channel and erosion zone would require minimal restoration. In the future, the BRDA 2A area may be all that remains as a permanent feature of the landscape, so full restoration efforts need only be focused on this 15-acre area. 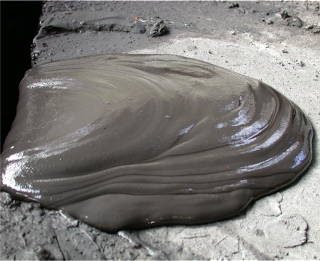 It is unclear how the slurried sediment will compress after drying at the disposal areas. Discussion during the December 4th meeting suggested that the material may reduce from 70lb/sq.ft to 150 lb/sq.ft, perhaps resulting in as much as a 50% reduction in disposal height. How this will affect revegetation/restoration is not clear, so adaptive management of revegetation efforts needs to be considered in the planning process. We submit this concept to clarify our preferred alternative for slurry disposal. We believe that temporary sediment storage, while having a short-term impact, will provide the greatest opportunity for ecosystem restoration and have the least impact on the affected community. The sign at the entrance to the Matilija Hot Springs below the dam tells the history. From 1887 until the 1980's, the hot springs drew people from afar for the healing properties of the natural springs as well as the scenic natural beauty of the area and renowned fishing. 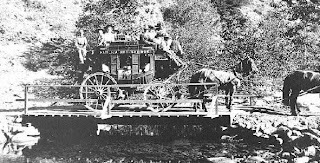 In 1947 as plans were made to construct a dam in Matilija Canyon, the Ventura County bought the land which held the hot springs. 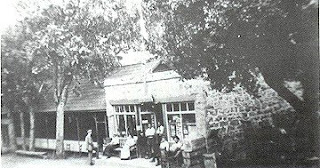 The resort was leased and continued to operate for many years as a health center. Much of the spa, however, was damaged in the floods of 1969. 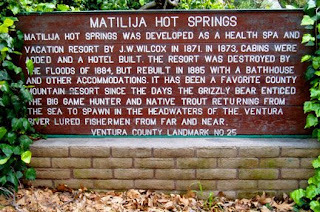 In the 1980's, due to difficulty with insurance, Matilija Hot Springs was finally closed to the public. Now, with the removal of Matilija Dam planned for 2013, the property will revert back to the county. This is largely due to the potential for increased flooding directly beneath the dam site. Because of the historical value of the site and its proximity to the dam, potential future uses may include a visitors center and access point to the restoration site upstream. 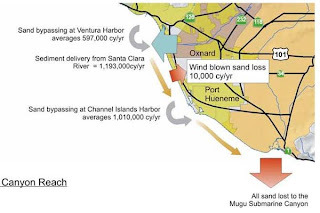 According to BEACON, average sand bypassing at Ventura County harbors is almost 600,000 cubic yards at Ventura Harbor and over 1 million cubic yards at Channel Island harbor. Their report illustrates how littoral drift transports sand downcoast, where it accumulates in sediment traps designed to keep the harbor entrance open for navigation. Because downcoast beaches depend on a steady supply of sand, these harbor sand traps need to be dredged annually to keep the sand moving down the coast. At the December 4th Design Oversight Group (DOG) meeting, the Corps of Engineers presented further information on the details of the proposed slurry operations. 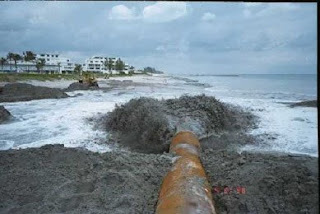 Standard slurry operations discharge the spoils into a temporary pool formed by sand berms. Dredged sand deposits in the pool, and slurry water flows out. 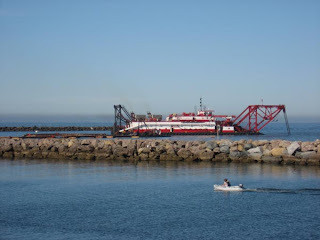 (This can be seen every year when the Ventura and Channel Islands harbors are dredged to bypass sand down the coast.) In this case, the 'turbid' (muddy) water left over flows into the ocean where silt is slowly dissipated. Because the Matilija Dam slurry operation will be transporting sediments much finer than beach sand, a more complex method of depositing the sediments is being proposed. 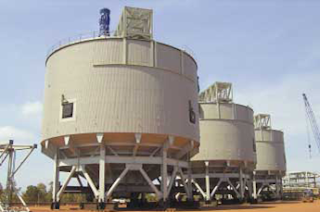 The "Thickening Method" is similar to that used in mining operations. · To harvest 100 percent of the water that falls on the land. · To store a majority of the roof runoff in tanks for domestic use. 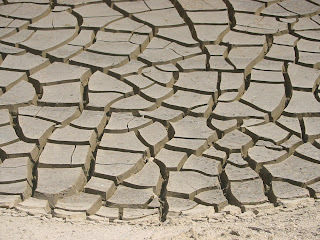 · To turn the soil back into a sponge to absorb and hold the moisture throughout the dry season. Water that falls on the roof will first fill up cisterns. After they reach capacity, overflow pipes will lead them to the highest point of the landscape – at which a pond will be located. Once the pond fills up, the spillway will overflow to a series of basins that will allow the water to slow down and absorb just where we want it – where we put in plants. After that it will fill up a second pond – with its inlet planted to reeds for filtering out sediment – and head to a final catch basin. If this ever overflows, then it will head to the street. This design was created by Devin Slaven of Ojai, and the owners are documenting their progress as they make their landscape "water wise" and "ocean friendly." Most troubling was the presentation by the consultant, who in trying to please everyone seemed to please nobody except the Parks Commission. In my comments I reminded the Parks Commission that the city is using drinking water to irrigate grassy lawns (and sycamore trees) while stormwater is flushed away in concrete storm drains. 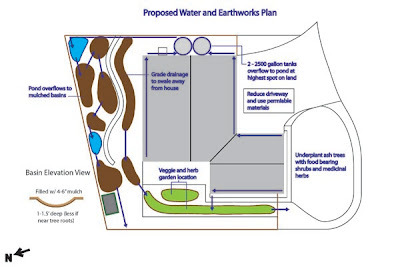 Our Urban Watershed Plan illustrated how Cemetery Park could fit into a stormwater strategy to capture and reuse rain water. 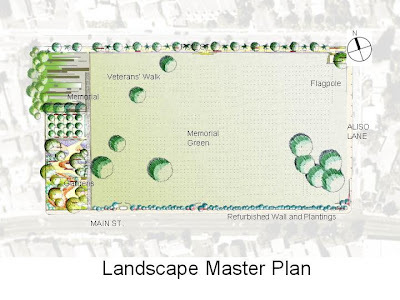 Unfortunately, this $4M plan for Cemetery Park does not provide any functional stormwater improvements. 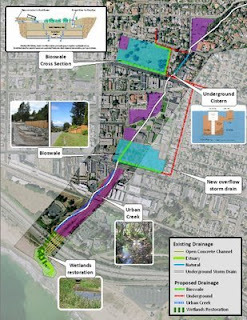 However, with the right designer and a regional plan, much of the improvements desired for this area could come from stormwater grants and Integrated Water Management Planning. For more on the park plan see the City of Ventura website.